Business or home... cover your walls with great artwork and/or marketing messages! It seems like everyone is printing artwork these days. We see it at Costco, Walgreens and even some Office Max Locations. But let's face it, the print quality leaves a lot to be desired. In fact, many of the canvas and art prints we create here are the customer's second attempt after experience the poor quality at one of these cookie-cutter print services. Our EPSON printers run the highest resolution color available in the industry and we give hands-on attention and care to each print. We will handle your print with kid gloves and send you a proof before printing the final product. One real benefit of using a custom printing company like Tower Media Group is we can hove our designers add lettering or graphic embellishments and shading to our print for a truly custom look. 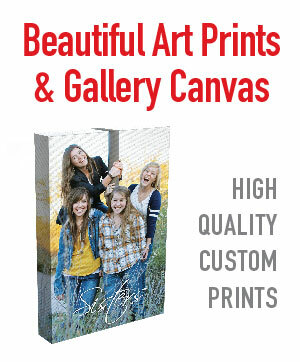 CANVAS PRINTS: Our canvas prints are stretched on 1.75 inch wood frames. You have your choice between white edges, black edges, or gallery wrap continuous image look. If you want to match the edge to a custom color to match the paint scheme of your home, just bring us the paint and we'll make it happen for you! ART PRINTS: Let us run your prized art file on our high resolution EPSON printers with archival inks and papers. Add your favorite frame and you're in business! POSTERS: We can also run event posters on a wide variety of substrates in sizes from 12x18 inches up to 5x8 feet.